Feel the Diffrerence of Luxury, Bedding For Yourself, Pamper yourself with the top of the line Dream Firm mattress for deep relaxation and rejuvenation. The beautiful knit fabric has traditional motifs, quilted for extra cushiony comfort, while the edges are upholstered in matching gray & white fabric. 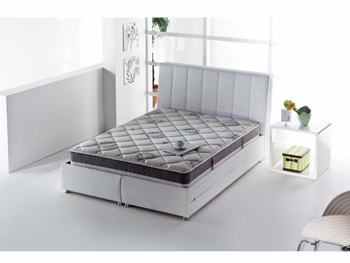 Dream Firm is a semi-firm orthopedic support mattress designed to deliver fabulous sleep each night. Dream Firm’s compact 9 inch height delivers every ounce of Istikbal quality that you’ve come to rely on over the years. Revel in your good fortune and enjoy extraordinary sleep quality with Dream Firm.